Looking for a quick and easy way to reduce your tax bill? Australian tax payers can reduce the amount of tax they owe by giving a gift of more than $2 to an approved charity (deductible gift recipient). There is no upper limit on the amount of donations you can claim a tax deduction for – but you can’t use a large donation to create a tax loss. Studies regularly show that people who donate money to charity feel much better about giving it away than if they had bought something for themselves with the same amount of money. You can claim a full tax deduction for gifts of money $2 and over to approved deductible gift recipient charities – there is no upper limit. If you donate money and receive goods or services in return, you can’t claim a tax deduction. For example if you get a chocolate bar, ticket to a charity dinner etc. Do make sure you get an official receipt for your donation. It may not seem worth asking the Red Cross volunteer collector for a receipt for $5 but small frequent donations add up. Shares valued at $5000 or less and bought at least 12 months before the gift was made, and property bought in the 12 months before donation can also be donated to charity. You may not be aware of this but if you give money to someone collecting for charity on the side walk, in a shopping mall stall or after clicking on an internet advertisement then most of your donated money could be paid to an advertising agency or commercial profit motived fund raising company as a commission. The best way to ensure that all your money goes straight to the charity is to donate to them by credit card by calling their phone number or directly typing their website address into your internet browser and paying by credit card online. Know where your money is going. Make sure your money is going right to the charity, and not through a middle man. Reputable charities have an expense breakdown, so you see how money is divided within the organisation. A good charity should spend at least 70-80% of donations on charitable activities and the rest on staff, expenses and advertising. I think that it’s better to give all your charitable donation money to one charity and make a big impact rather than giving small amounts to many different charities. Pick one charity and give to it each year. Thousands of charities are out there. Are you passionate about fighting breast cancer? Look for a local cancer charity. Want to help the homeless? Give to a soup kitchen. Pick a cause that means something to you and stick with donating to that cause. Check credentials. It’s easy to donate to big well known charities like the Red Cross or UNICEF and be confident that your money is going where it should. However if you choose to donate to a smaller charity make sure it’s a registered deductible gift recipient Australian charity by going to www.abn.business.gov.au. Enter the charity’s Australian business number (ABN) or Charity Name in the search box. Scroll down to “Deductible Gift Recipient”. If the organisation is a DGR it will be displayed on screen. I choose to make my yearly charitable donation to the conservation charity Bush Heritage Australia: protecting land, water and wildlife as well as cultural heritage, for the future of all Australians. Watch the video below from “Generous donation saves Australian bushland” a TV News story on ABC1’s 7:30 Report. View the Australian Tax Office website fact sheet about Making tax deductible donations, call the personal tax enquiries hotline on 13 28 61 or speak to your accountant for more details and personalised advice about donating to charity. I donate to several charities but not to reduce my tax bill. My favourite one is World Vision, where I have sponsored 2 kids for years. Another favourite is the Epilepsy association because my son suffered seizures when he was a baby. The problem with charity donations is that so many different ones exist and you simply cannot donate to all of them so it is best to choose a few that you like for some reason and support them. EDITOR: Don’t get me wrong, I don’t donate to charity for the tax benefits – that’s merely a bonus. I also do regular volunteer work for charities and non-profit associations which would have far more value than a $ contribution. I wasn’t implying that at all. I wish my tax bill was large enough and that I had excess profits that I could donate to charity to offset the tax bill but unfortunately I simply do not make enough. Maybe one day I will be in that boat and I will be able to pump more into charity. Wonderful post. I think giving to others — no matter how much or how little — is always a great thing! My charity of choice is St. Jude Children’s Research Hospital in the U.S. I keep track of my monetary donations to them or anyone else, but I really need to start keeping track of other donations I make (clothing, appliances, etc). It probably won’t make much of a difference in my taxes, but every little bit helps. Even if there wasn’t a tax benefit, I would still donate money, items, and my time. I think charitable giving is a great option for businesses as well as individuals– but again, as Sire mentioned, it’s a really big problem trying to figure out which cause you want to give to when there’s so many charities out there! I like how you can get a tax break for any donations that you make, but I think that it would be a lot betetr if people just donated without looking at the tax break. People should be donating all the time to help those in need. But thanks for sharing about yours. It is a good cause no matter how you donate. Excellent post. Donation’s should reflect something personal and important to the donor. It’s a good way of setting a good example for others and also getting the chance to meet and help others who can relate to what’s important to you. I, for one, think that this is a great idea. The world really would be a better place for all of us if we’d all chip in to the charities that are most meaningful for us. These are the agendas adopted by celebreties and rich people to protect themself and their money going to tax department. This is the smart way to save money. I was reading in newspaaper that one celebraty annonced to donate 100,000 in charity, but end up in donating 15000. That was only for publicity. How much do you get back from tax? What is the percentage that you get returned ? Every dollar you give can be claimed back as a donation when you put your return in. You will get back every dollar that you give. 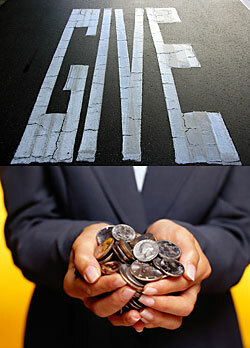 If you have paid enough income tax you will get a refund including the amount of donation money you have given. So give your refund to charity!!! If you have not paid enough, the donation deductions go towards the outstanding debt to the government. This is why the rich and famous do it, they don’t have employee’s paying as they earn. I donate 20% of my income regardless, but alas I’m not rich and famous! I am in the same situation, but I’m confused by Ash’s comment…http://www.ato.gov.au/nonprofit/content.aspx?menuid=0&doc=/content/34496.htm&page=4&H4 The example on this page towards the bottom suggests that the gift is fully claimable? as per the ato site…. “Example: Dominic’s assessable income in his tax return for 2006-07 is $15,000. He has donated $20,000 to a DGR during that year. He has no other income or deductions in his tax return. The tax deduction he can claim for his gift is limited to $15,000. This is because a deductible gift cannot add to or create a tax loss.